Bullying prevention has been a major focus for schools for the past several years, and it can be a good entry point for sexual and dating violence prevention efforts to get into schools. Over the years, there has been more and more support for the “bullying – sexual violence pathway,” a theory that children who bully other children are more likely to perpetrate sexual violence, like sexual harassment, unwanted touching/groping, and maybe even more severe sexual violence, as well as teen dating violence. New research by Dr. Dorothy Espelage et al. adds another dimension to this pathway that can be important for prevention. 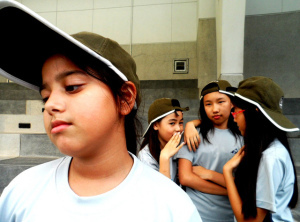 They followed almost 1,000 fifth-seventh graders for two years and measured their bullying perpetration and homophobic teasing perpetration as they related to later sexual harassment perpetration. Preventing sexual harassment is a really important goal, since according to another recent study, about 1 in 8 boys and 1 in 20 girls perpetrate sexual harassment in high school. The study found that girls who bullied others at the beginning of the study were over 3 times more likely to sexually harass others two years later, but homophobic teasing didn’t affect this relationship. Boys who bullied others were over 4.5 times more likely to perpetrate sexual harassment than boys who didn’t bully, and boys who engaged in homophobic teasing were 1.66 times more likely to perpetrate sexual harassment than boys who didn’t. Interestingly, if boys engaged in a lot of bullying and a lot of homophobic teasing, they were even more likely to engage in sexual harassment two years later than boys who did both bully and engage in homophobic teasing, but did so rarely. Clearly, preventing bullying can have a big impact on preventing sexual harassment for both boys and girls. But it looks like it can be important to also focus especially on preventing homophobic teasing by boys. Not only would this focus make a stronger connection between bullying and sexual violence, but it also supports our goals of preventing violence against all people, regardless of gender or sexual orientation, and of challenging oppressive gender roles. If boys can be free from homophobic bullying or gender policing, maybe they’ll be less likely to be hostile toward people and traits they deem feminine and more likely to be openly caring, sensitive, and empathetic.